We’re straying a little bit from our typical design style to bring you a flexible news WordPress theme. Prime Time is built on top of the Theme Blvd framework. Use the layout builder to accomplish just about anything you can think of. Use the slider manager to create as many sliders as you want. Use the widget area manager to create as many widget areas and sidebars as you want. With just the right amount of theme options and flexibility, the power is all in your hands. And with a sleek, responsive HTML5 design, you’ll be sure no one will miss out on your new website built with Prime Time. Option to tu special stylesheet that targets tablets and mobile devices off or on. Theme Blvd Admin Presence – Show or Hide theme’s admin pages. Theme Blvd Featured Videos – Replace featured images with embedded videos. Theme Blvd Image Sizes – Adjust your theme’s image crop sizes. Theme Blvd News Scroller Widget – A widget that scrolls through posts. Theme Blvd Piecemaker Addon – Add Piecemaker onto theme’s built-in sliders. Theme Blvd Post-to-Page Link – Link a post to a page for modifying the breadcrumb trail. Theme Blvd Responsive Google Maps – Responsive Google Map shortcode. Theme Blvd String Swap – Quickly translate text strings on frontend of your site. Here is the quick step-by-step guide for how this theme’s demo homepage was setup from the WordPress admin panel. You can find much more information on the following steps in great detail by viewing the documentation that came in your theme’s download package. Keep in mind this is only a quick step-by-step for the theme demo’s homepage and you definitely do not have to setup your site in this way if you don’t want to. Install the theme under Appearance > Themes. Go to Settings > Reading > Frontpage Displays, and make sure you’ve selected “your latest posts”. Go to the Sliders page and create a custom slider. Go to the Builder page and create a new custom layout. Use “Prime Time Homepage” as your layout’s starting point. 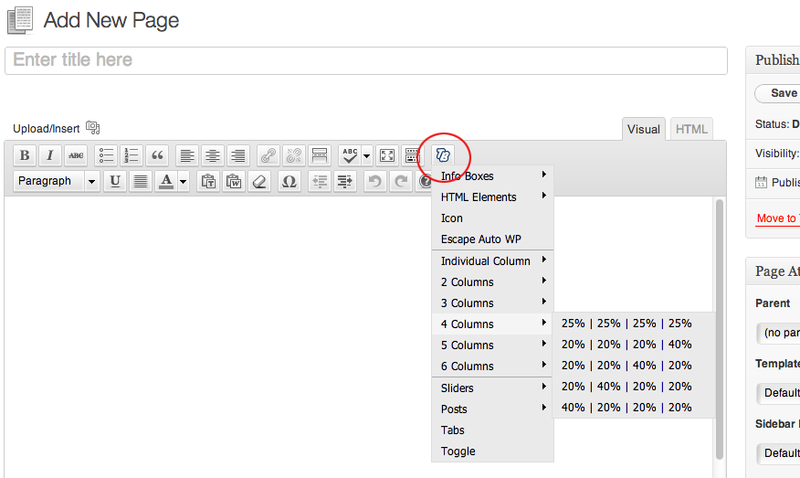 Configure your element settings, including selecting your custom slider in the slider element, and save the layout. Go to Appearance > Theme Options > Content > Homepage, select to show a custom layout, and select the custom layout you’ve created. For your reference, listed here are all of the image sizes that your images get cropped to when using this theme. If your WordPress installation already has many images uploaded, it’s best to run the Thumbnail Generator plugin after installing the theme. 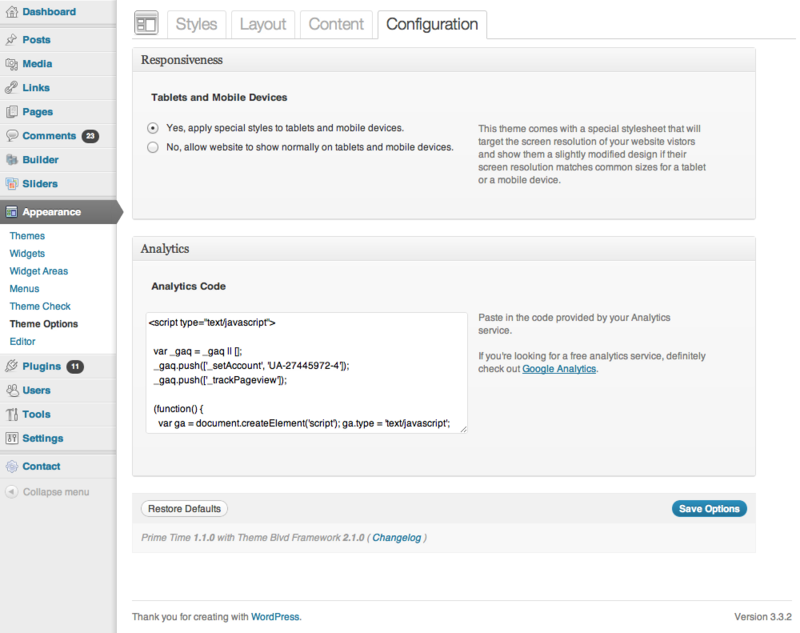 In order to run this theme, your server must have PHP5 and you must have WordPress 3.1+ installed. * This is the first release constructed from Theme Blvd Framework version 2.0.2.